Last month, President Trump released his budget for fiscal year 2019, which outlined the Administration’s budget projections and policy proposals for the next 10 years. The President’s budget anticipates that revenues will grow from 16.7 percent of GDP in 2018 to 17.8 percent of GDP in 2028. However, the revenue numbers are noteworthy because they incorporate the Tax Cuts and Jobs Act (TCJA), which was enacted at the end of 2017. The budget shows that the TCJA will lower revenues significantly, which can be seen by comparing the Administration’s current revenue estimates with those of a year ago. This year’s budget anticipates that revenues will equal 16.3 percent of GDP in 2019 — significantly below the estimated 18.2 percent in last year’s budget. Similarly, the Administration now estimates that revenues in 2025 will equal 17.5 percent of GDP, down from the previous budget’s projection of 18.2 percent for that year. Such a reduction in revenues would exacerbate our already unsustainable fiscal outlook. A number of the TCJA’s provisions are temporary, particularly those that apply to individuals; 23 of those provisions are scheduled to expire at the end of 2025. The President’s budget proposed extending those expiring provisions permanently, which would require new legislation and cost the government $569 billion from 2026–2028. 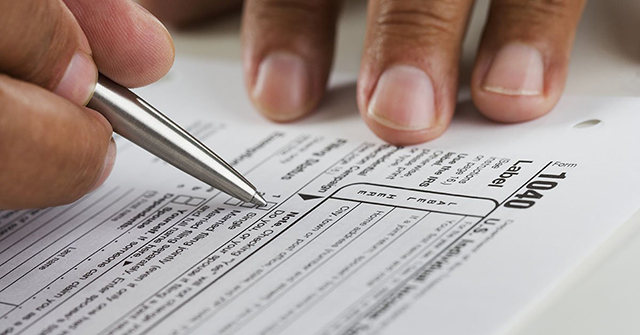 If the provisions related to individual income taxes are allowed to expire, tax rates and brackets would revert back to where they were in 2017. 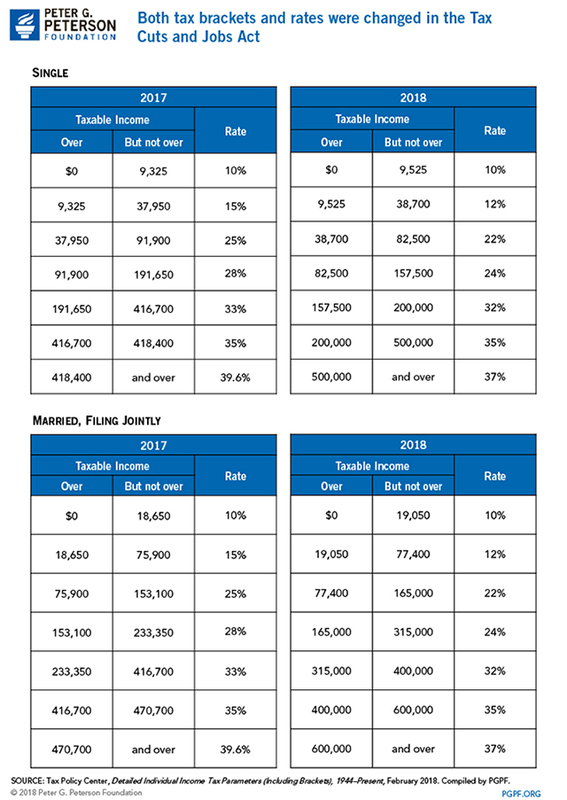 The tables below show individual income tax rates and brackets before and after the TCJA, for single and married taxpayers. The number of brackets was unchanged at seven. The TCJA made changes to both tax rates and bracket widths. 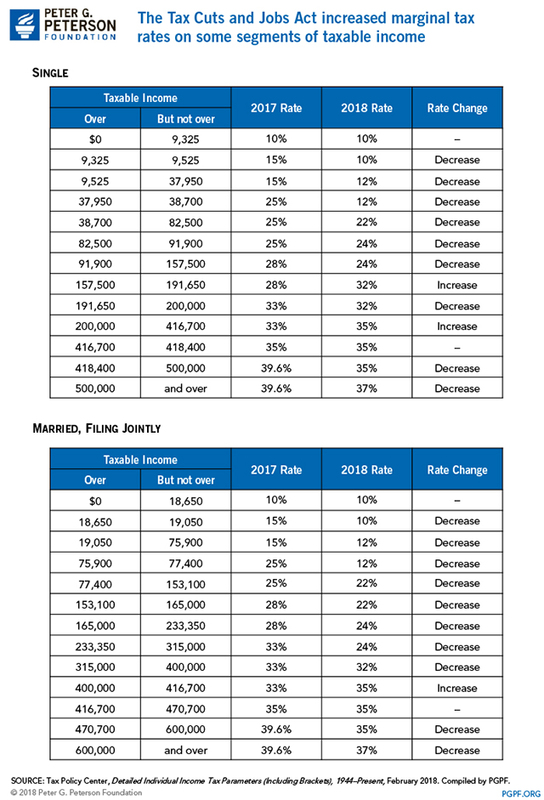 The tables below show how the marginal tax rate will change in 2018 for each segment of taxable income. It shows that despite a reduction in rates for most people, some portions of taxable income now will be subject to a higher marginal tax rate. For example, income between $157,500 and $191,650 is now taxed at 32% for single filers, compared to 28% before the TCJA.